I (Kati) will be the first to admit that before we review a restaurant, I often have preconceived opinions. It’s hard not to since I have lived in Huntington my entire life! I can vividly remember having a saucy face at Jim’s Spaghetti as a kid and digging my paw into the toy basket at Bailey’s cafeteria (special props for people who get that reference). However, I can speak for both of us when I say we walked into Bodega with quite a different view than when we walked out. And let’s be clear – we already had a positive outlook when we entered. Interviewing Chef Susan, experiencing great hospitality, and hearing her vision for not just Bodega but all of Huntington made our hearts full. Not only that, but our previous reviews came from restaurants that have been around much longer than Bodega. Considering it only opened in February, it’s important to value a restaurant for what it is now but also to admire where they hope to be in the future. That’s the thing with local spots– they don’t pop up with a cookie-cutter menu and scripts. One of the fun parts is watching them evolve and mold into their character. ​Bodega is hard to describe because it’s a little bit of everything! A cafe, a market, a place to grab a drink with a friend, etc. And that’s exactly what Chef Susan had in mind when she envisioned it (more on that later). She hoped that it would be a place that was “a feast to all the senses,” and as soon as you enter, it certainly feels like Bodega has achieved this goal. Since Bodega is unique in this sense, our review layout will be a little different than standard app, entree, dessert. House brewed loose leaf iced tea: typically tea (without any form of sugar) seems a bit bland, but this little number is packed with berry flavors and bursts of spice that were tastefully refreshing. Key lime Pie Italian Soda: can’t eat a slice of key lime pie? It’s okay. Just drink this. Seriously. Drink it all. It tastes JUST like a key lime pie…complete with the whip cream on top. Chipotle Pineapple Italian Soda: nice blend of sweet and tangy with a tiny kick of spice. Probably unlike something you have had before so definitely worth a try. 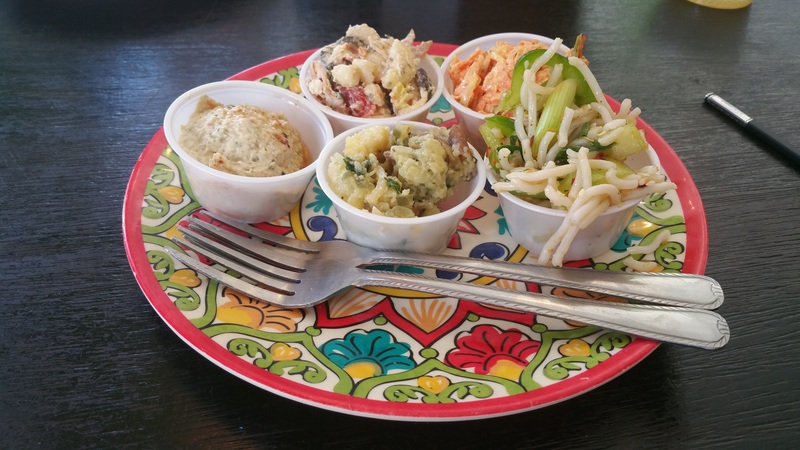 Hummus: easily some of the best hummus in town! Everything Pizza Pasta: You know how the last several times you were eating some bland pasta salad you thought “man i wish this side had some of my favorite pizza toppings on it”? Well Bodega must have read your mind because they took this pasta salad and loaded with tons of flavor. Bunny Salad: Carrots, onions, grapes, and all the other things a bunny may enjoy. Mayo based and my (kati) personal favorite of all the sides! French Potato Salad: No mayo here; But you won’t miss it! Olive oil and lemon give this classic dish a little makeover that you will certainly enjoy. Thai Chili Pasta: this creative side has some familiar flavors formatted in a new way. Definitely spices up the traditional pasta salad. Kati’s order: #2: Mozzarella, House Pesto and Tomato. A perfect selection for a meatless Monday lunch! The ooey-gooey mozzarella melted in my mouth while the freshness of the pesto and crunchy, buttered bread team up to make this simple sandwich super tasty. Each sandwich comes with a side of Carolina coleslaw. It’s pretty standard, but as a slaw fan, I enjoy it as a garnish. Oh my. I appreciate the fact that Bodega has a seasonal menu that will see items come and go, but i’m going to have some serious separation anxiety when this beauty bids farewell. I already knew i was going to be a fan because of the bacon, but the real MVP is this Cloverton cheese which is made locally. It is incredibly creamy and rich and serves as the perfect compliment to the buttered bread and bacon. 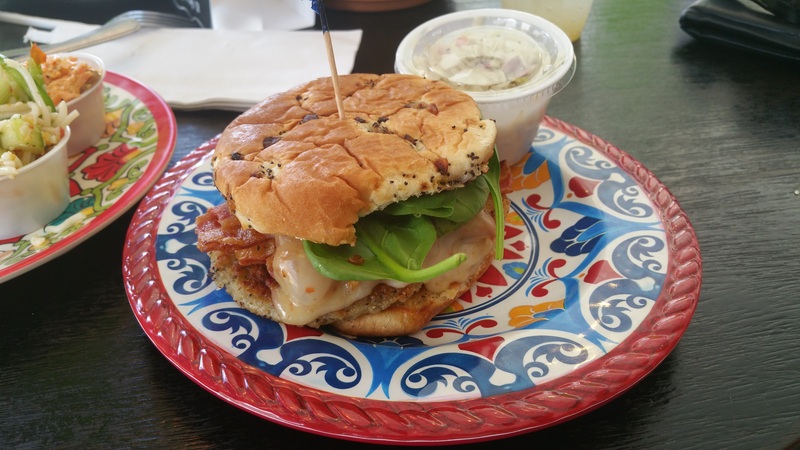 While the fried green local tomatoes aren’t actually fried, they taste like they are and are healthier for you, plus they are awesome on this sandwich. I personally like asking for the ghost pepper cheese on all my orders and it provides a very spicy addition to each bite. Check it out if you dare. ​Per Chef Susan, this item has been leading the way for this seasonal menu, and it’s easy to see why. Just as most people enjoy a heaping chip full of buffalo chicken dip at tailgates and super bowl parties everywhere, this sandwich offers a similar, fresher taste in sandwich form. 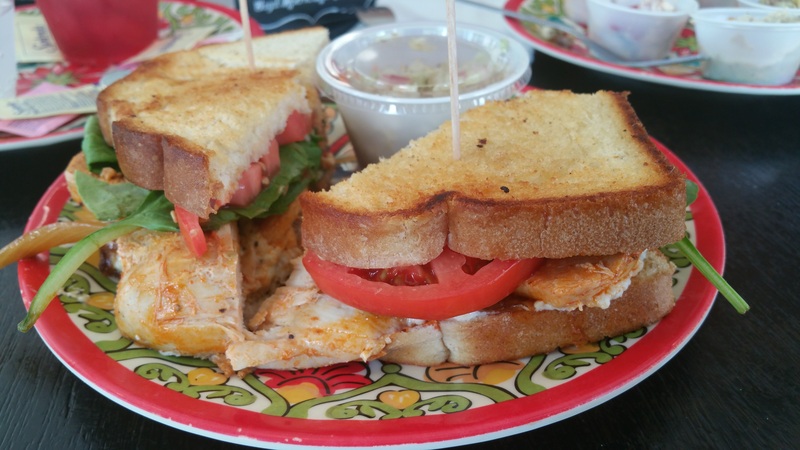 The chicken is tossed in house-made buffalo sauce, the bleu-cheese spread is also homemade (and AWESOME), then add caramelized onions, and local greens and a tomato…all on toasty, buttery bread! I always ask for staff recommendations, and had it not been for their suggestion, this option may have been overlooked. I would have figured it was a simple grilled cheese, with perhaps some Italian spices but, soft! For this is actually a meat packed deli treat. It would be a good grilled cheese sandwich on its own with its crispy Italian bread, provolone, banana peppers, and tomatoes. However, they kick it up a notch (or three) by adding crisped pepperoni, ham, and salami to the mix. Staff recommends it and so do i. Our vision when we created the concept for The Bodega was to open a quirky little corner store that would be a cool place to grab lunch, run in and shop for unusual grocery items and wines, sit down and try a new craft beer or mix and match a six pack to take home. We wanted it to be a bit off beat and funky, a place that was a feast for all the senses, so to speak. We also had a goal to as much of our spending power in our own community as possible. We are always sourcing local produce and cheeses and grocery items. We are very quality conscious and have high standards for our ingredients. We make our own sauces, jams, etc. I believe that is also what sets us apart. We have taken a concept of a market and café and brought it into an area where that had never been done! It was interesting trying to get all of our licenses etc. They kept saying…”You want to do WHAT?” Selling groceries, sitting in a “market” and eating, having a glass of beer or wine or picking it up to take home just hadn’t really been done. It is a concept we feel like we can continually grow and expand upon. Lastly, I would like to think what we are doing that makes us stand out is trying to be a part of a growing downtown. We don’t view our neighbors as competitors, we view them as partners. The more successful restaurants, shops etc. there are in downtown Huntington, the more people will be drawn to the area. We will all share in the rewards of a vibrant downtown. No matter how wonderful my food may be, I cannot operate in a vacuum. No one wants to eat the same thing day in and day out. Variety is the spice of life and I hope to see plenty of other creative and inspired people come downtown and hang their shingles! WHEN TO GO: Perfect spot for lunch! But not a bad idea to spice up your dinner by grabbing some sides to-go and mixing your own 6 pack of beer. BEST PART: The Ownership — Chef Susan loves this community and wants it to thrive, collectively. We also love the seasonal, rotating menu… never a dull moment! 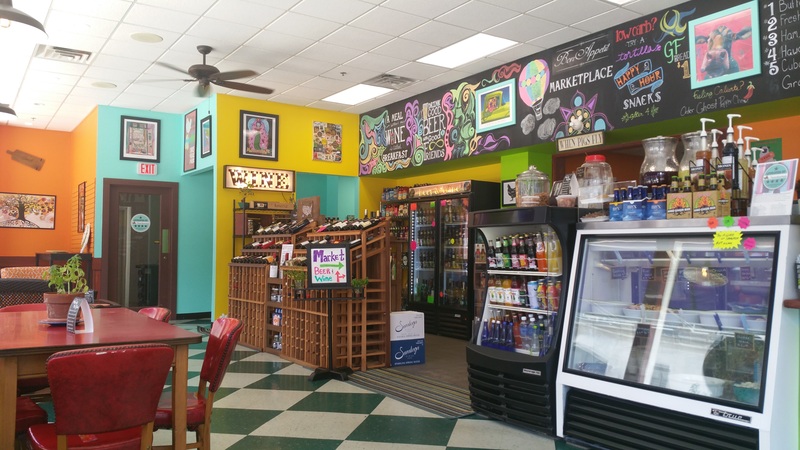 WHAT SETS IT APART: The colors, the art, and the layout… just sitting in Bodega will brighten your day. ROOM FOR IMPROVEMENT: Our only qualm is that a cup of tap water is not an option for a drink. Bottled water isn’t our friend 🙂 Tap water now available! HOW TO FIND IT: 335 9th St, Huntington, WV or https://www.facebook.com/pages/The-Bodega-WV/296921303832527? HINT FOR NEXT MONTH’S BLOG: Okay – for sure next month will be our first food battle. Love the reviews! For us out-of-towners, you should put a link to the location or restaurant’s website. I LOVE and CRAVE the grape and blue cheese sandwich. It’s unique and unlike anything I’ve ever had. I have one once a week and already dread when it’s no longer available.